Musings from Marilyn » Knit a Vintage 50s Version of Kate’s Angora Bolero! Posted May 2, 2011 by finnfemme & filed under Fashion, Vintage. Since I was so enamored of Kate Middleton’s fluffy white angora bolero that topped the gown she wore to her wedding reception at Buckingham Palace (see my previous blog post of April 30th), I thought to look through my vintage knitting patterns to see if I could find a similar design. I collect vintage sewing and knitting patterns and have quite a stash. I was fortunate that this snazzy little knit bolero sweater pattern was right up on top of said stash! 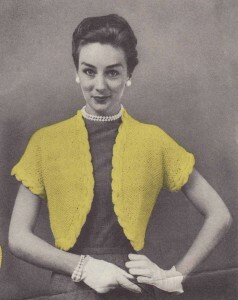 Super cute, ‘Knit Bolero with Cable Trim’ knitting pattern from the 1950s. Boleros are classic, timeless and never go out of style. This one has short sleeves, which would be perfect for spring and summer, and a cable trim for a bit of texture. The pattern is for sizes 12-14. Please bear in mind that vintage 50s sizes are radically different from modern sizes! A size 12 would be a 32″ bust, and a size 14 would be a 34″ bust. The materials call for all purpose yarn, but it would be absolutely smashing if a fluffy yarn such as angora or mohair were substituted. I’m pretty much a novice knitter, so I wouldn’t be much help in knitting assistance. I trust you expert knitters out there will know what to do. Happy knitting! 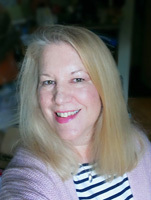 thank you for sharing the knitting pattern do you think that the heavier cable around the edge will work in an angora yarn or will it get lost in translation? You’re welcome, Violet 🙂 I am thinking that the cable edge would work using angora, as I’ve seen some great angora sweaters knit in designs. I also think it would provide a bit of structure to the sweater. If you make it, I would LOVE it if you could send me a picture! Yes, I do have MANY vintage knitting patterns. I will be posting more vintage sweater patterns in the days to come. They are SO fun, and yes, very unique and unusual. Do you have any suggestions as to where to buy the best selection of Cashmere or angora? Good luck knitting the bolero! I posted another 50s version knitting pattern yesterday. Kindly note that both websites mentioned in the last post are the same and owned by the same Chilean company. There any many articles and reports about Chileans abusing the rabbits by pinning them to boards when being shorn, to stop them wriggling and keeping them in cages so small they can’t move. So, while I agree their yarns look amazing, it would be regrettable to encourage this potential conduct.